Sangha’s Prayer says,‘ಶ್ರುತಂ ಚೈವ ಯತ್ ಕಂಟಕಾಕೀರ್ಣಮಾರ್ಗಂ | ಸ್ವಯಂ ಸ್ವೀಕೃತಂ ನಃ ಸುಗಂ ಕಾರಯೇತ್|’.. Initial years of the Parishat were really a picture of this. Problems are always bound to come. Face them and win. Proceed and take a new task, again face the challenges, again surmount them. Struggles give happiness. Parishat was a very good example for this. Parishat started its life in a rented building on South End Road.. 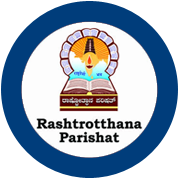 When the idea of starting an organization named ‘Rashtrothana Parishat’ cropped up, it intended to bring social reforms through literature. As a first step ‘Utthana’ (Ascent) a Kannada monthly was started. The first edition rolled out on 05.10.1965 (Vijayadashami). 5000 copies were printed! Dr. Suryanatha Kamath was the first Editor. Our first book was ‘Ranaveelya’ (‘ರಣವೀಳ್ಯ’). It contains the stories of soldiers who became martyrs during the attacks by Pakistan and China. The book was published on 05.12.1965 (Geeta Jayanthi); 3000 copies were printed priced at 1.50 Rs. each. Second book was ‘Yavana Vijetha Chandragupta’, (‘ಯವನ ವಿಜೇತ ಚಂದ್ರಗುಪ್ತ’) and the third, ‘Kannadada Kadugaligalu’, (‘ಕನ್ನಡದ ಕಡುಗಲಿಗಳು’). Our next publication was ‘Atmaahuti’ (‘ಆತ್ಮಾಹುತಿ’). It was in an autobiographic style, authored by a Pracharak. We thought of inviting a freedom fighter or a revolutionary to dedicate the book to the world. After discussing a few names finally we invited Vidyavathi Devi, mother of martyr Bhagat Singh. His brother Kulabir Singh accompanied the aged mother. She came by train all the way from distant Punjab. Let alone arranging for her air travel, we could not even afford first class travel for her. Anyway, the event went very well at Sir Puttannachetty Town Hall. 600 copies were sold on a single day! It was a record at that time. Many congratulated us. Thus our journey went on, finding joy in facing newer and bigger challenges. We were so accustomed to facing challenges that we used to feel lost when there were none! This was the mental strength of workers in those days. Any new work would bring with it newer and greater challenges. Thus we planned publication of 500 Bharata-Bharati books. Initially it was named as “Kishora Sahitya Sampathu’ (‘ಕಿಶೋರ ಸಾಹಿತ್ಯ ಸಂಪತ್ತು’). When we met and decided upon this task, we had no inputs and we needed an editor. We found Prof. L S Sheshagiri Rao, a renowned litterateur and exemplary critic. We requested him to be the chief editor of our series of 510 booklets. Previously once we had requested him to translate Sri Guruji’s “Bunch of thoughts’ to Kannada. It was a tough nut job. Prof. Rao had accomplished the task admirably. When we requested him to be the chief editor of Bharata-Bharati book series, he whole-heartedly agreed. The price of the book was then a mere 75 Ps. Meanwhile we had shifted our office from South-end to the present place, at Kempegowda Nagara. We had the mental toughness to face any kind of challenges. As a result, Parishat developed. And today, its fragrance has spread throughout the STATE.